Learn How to Combat Your Phobia of Roaches with Hypnosis! Can hypnosis really help overcome deep rooted fears? No matter what you are afraid of, hypnosis can change the way you feel when facing one of your fears. For example, mice, bugs, roaches, rodents or insects of any kind are all much smaller than a human being, yet can cause full-grown adults to shutter with fear. A fear of roaches may seem irrational to those who think this way, but for others the fears are real and can be extreme, often inhibiting normal living. My Fear of Roaches Hypnosis MP3 can help! Steve G. Jones is skilled in helping many people overcome various fears through self-hypnosis coaching. The ability to eliminate a fear of roaches completely and permanently is revealed in his program, Fear of Roaches Hypnosis MP3. In less than a month, both the fear of roaches and the sense of loss of control can be eliminated. Steve G. Jones, Ed.D., Clinical Hypnotherapist, charges $1,500 for a custom recording and $25,000 for a one-hour private hypnotherapy session at his office. But you can get all the benefits for this low price. Simply listen to the Fear of Roaches Hypnosis MP3 session every night as you go to bed for three weeks and feel the changes happening in your life. You will feel more empowered, more in touch with your true self, and you will truly know that your goals are within your reach. Steve G. Jones achieves AMAZING and LASTING results!!! Hypnosis is the easiest way to affect change in your life because the positive messages go straight to your subconscious mind effortlessly so you can accomplish your goals and reach for the stars!! All you have to do is listen to the Fear of Roaches Hypnosis MP3 download at night as you go to sleep!!! You’ll hear soft music, the gentle sounds of the beach, and the soothing sound of Steve G. Jones’ voice all working together to bring about positive changes in your life easily and naturally. Steve G. Jones has been helping people improve their lives with hypnosis for over 17 years…now it’s time for him to help YOU… don’t wait, do it NOW !!! you’ll be glad you did. See you at the top! And as you continue relaxing deeper, deeper, and more deeply relaxed, I would like you to imagine yourself in a movie theater. Imagine yourself sitting in the front row of the movie theater. I would also like you to imagine yourself at the same time in the projection booth running the movie, that’s right. So you can imagine yourself being in two places at the same time. In the front row of the theater and in the projection booth running the movie. And at anytime you can move your consciousness between either of these two positions. So for example, if you choose to be in the projection booth you simply imagine that you are in the projection booth. And if you choose to be in the front row, you simply imagine that you are in the front row because you are in both of these places at the same time. So you simply move your consciousness from one place to the other and your point of reference changes. It’s that simple. So I’d like you now to imagine yourself in the projection booth. That is your point of view. And you can look out through the projection booth and see yourself sitting in the front row of the theater. And since you are just imagining this, it seems perfectly natural because you can imagine anything you choose to imagine. In the movie that you are showing yourself is starring you. Now, you are safe in the projection booth watching yourself watching the movie and you are in the movie. So now you are in three places at the same time, in the film on the screen, that’s one, in the front row of the theater, that’s two, and in the projection booth, that is position number three. Right now you are in position three watching yourself in the front row as you watch the movie starring you. And because you are simply imagining this, you realize that it is fine to imagine yourself in three places at once. So now as you continue showing the movie, the movie starring you, you look out from the projection booth and you see yourself watching yourself on the screen. And as you look at yourself in the front row, you look very calm. And as you now look at the screen, you see yourself in the movie. You see yourself standing in a kitchen in the movie and there are several roaches near you and you see yourself in the movie very calm and relaxed as you walk around the kitchen and the roaches are also walking. Notice how calm you are. Notice how calm you are as you sit in the front row. Notice how calm you are now in the projection booth, in position number three. That is your point of reference now, the safety of the projection booth where you can stop the movie anytime you choose and you are protected by a thick wall of glass. And as you continue watching yourself in the movie you see yourself now in a bedroom near some roaches. And you see one crawl on you. Notice how calm you are, how amazingly calm you are in the movie. Notice how calm you are sitting in the front row of the theater. And of course, how calm you are in the projection booth where you are in charge of the movie. Calm and relaxed. And now you see yourself outside. You see yourself in the movie outside and there are roaches near you. In fact, you even see one crawl onto your foot. Notice how relaxed you are in the movie because it‘s just a movie. Notice how relaxed you are in the front row of the theater because it’s just a theater and of course how relaxed you are in the projection booth because you are in charge. You are relaxed and confident at all times. And now I would like you to imagine your consciousness moving to position number two where you are sitting in the front row and at anytime you can move back to the safety of position number three, the projection booth, and you can stop the movie if you choose, but for now I invite you now to move to position number two, the front row of the movie theater and to continue watching the movie starring yourself. It is now a new scene where you are again in the kitchen and there are roaches near you. And you are smiling and laughing because you are so relaxed around them. And you see one crawling on your arm now and you smile and laugh and gently brush it off. And you continue what you were doing in the kitchen, so relaxed. There are roaches near you yet you are relaxed and happy and peaceful. And now if you are comfortable with this idea, I would like you to picture yourself in position number one in the movie itself and remember at anytime you can move back to position number two or position number three, but right now you imagine yourself in position number one in the movie standing in a hallway in a house and there are several roaches near you on the floor. They are walking and you see yourself relaxed and happy and smiling. You are in the movie, in the movie and you are relaxed. And you notice this about yourself. You look down at the roaches and you smile. You walk past them and you continue walking and relaxing and you walk into the kitchen area and there are three roaches on the kitchen floor and you smile and laugh and you walk past these roaches and now one flies through the air and you laugh and point at it. It lands on the wall and you smile because you are so relaxed around roaches. So relaxed, they seem silly and funny to you. You very peacefully leave the kitchen now, so relaxed as you go. And each time you listen to this recording you will become more and more comfortable around roaches and when you see roaches they simply make you smile and laugh because they are so funny and silly and you are so comfortable around roaches. So relax and just drift now. Roaches are bugs that have no redeeming qualities, but there is no need to be scared of them. If you live in a warm and humid area, they are going to be a part of your life. You can take the necessary precautions from having them in your house and hypnosis will help you overcome your fear of roaches. First, you should do everything you can to eliminate them from your home. Have a pest control company come out and spray your foundation routinely. You can have roach cups in various parts of your house that entice them and kill them. You will also want to make sure that you keep a clean home. Once you have done the necessary preventative tasks, you can then work on your fear of roaches. Hypnotherapy will teach you that there is no reason to fear roaches. They will not harm you. Hypnosis will also show you how to accept them. 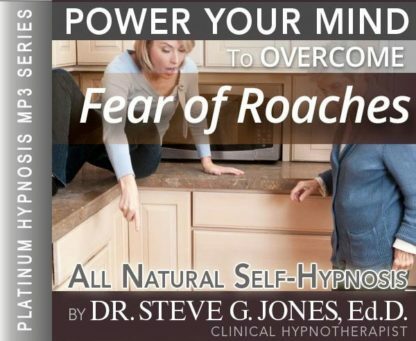 This hypnotherapy program will help you calm your fears in relation to roaches. You will no longer feel a sense of panic and anxiety when you see a roach. Hypnosis is a very effective way to overcome your fear. Steve G. Jones uses a powerful technique to expose you to imaginary roaches (at a distance) so you learn to calm your fears. You may be able to control the roaches in your house, but you will not be able to control what you see outside. The Fear of Roaches Hypnosis MP3 will help you be okay with this. You do not need to live in fear any longer, self-hypnosis to overcome fear of roaches will help you! You can live in the same world as roaches without feeling panic or anxiety when you see one, thanks to hypnotherapy!